This fortnightly email is to keep you updated on Women with Disabilities Victoria work and news in our priority areas. Contributions to this eNews are welcome, email wdv@wdv.org.au. Now as much as ever we need organisations run by women with disabilities. WDV has a place as leaders representing women with disabilities as the NDIS rolls out and changes the way disability services work. We have a place as experts advising the state government in designing ways to uphold the rights and safety of women. We have a place working with women to share skills, build community and grow pride as women with disabilities. - Enabling Women is a 6 week community leadership program. The program will run through the year in partnership with local organisations around Victoria. We will keep you posted on opportunities to be involved or contact our new Program Manager, akii.ngo@wdv.org.au. - Our Right to Respect! is a Peer Education Program. This is coming up soon in Murrumbeena (28 Feb-21 March) and Ringwood (9-30 March). If you're interested in coming together with other women with disabilities to talk about respectful relationships, your rights, and health and well-being services. Find more information or contact bianca.evans@wdv.org.au. - The How to Engage with the NDIS Program is being developed to give women information and skills to have choice and control with the NDIS. We are starting by listening to our Enabling Women graduates and hearing what they want to know about the NDIS. Inquiries: cath.mcnamara@wdv.org.au. We encourage you to learn more about these programs if you are interested. We look forward to the year ahead, working on these programs with a range of partners and women with disabilities across Victoria. We welcome three new staff to our team. It's great to have them on board. Akii comes to WDV from a public health background. She holds qualifications in Dietetics, Chronic Conditions Management, Training, Project Management and is currently undertaking her Masters in Social Work. Akii has lived in many parts of Australia as well as overseas. She says, "As a woman who has lived with an invisible disability and chronic health, I have a strong sense of social justice for all people, regardless of gender, sexuality, race or disability." Lis says, "I am thrilled to be a part of the expanding team here at Women with Disabilities Victoria. I have come on board as Keran’s assistant and it is my goal to make her administrative tasks a bit lighter so Keran can concentrate on fighting the good fight! I am proud to be working in a feminist organisation, and I am happy to be working with strong advocates." PHOTO LEFT TO RIGHT: Akii, Bridget and Lis. The Your Right to Respect Peer Education Program offers opportunities to explore respectful relationships, experiences of being a women and women’s and disability rights. The program will run from the 9th of March on Thursday mornings for 4 weeks between 9:30-1:00pm in Ringwood. For more information please contact Bianca Evans on 9286 7809 / Bianca.evans@wdv.org.au. 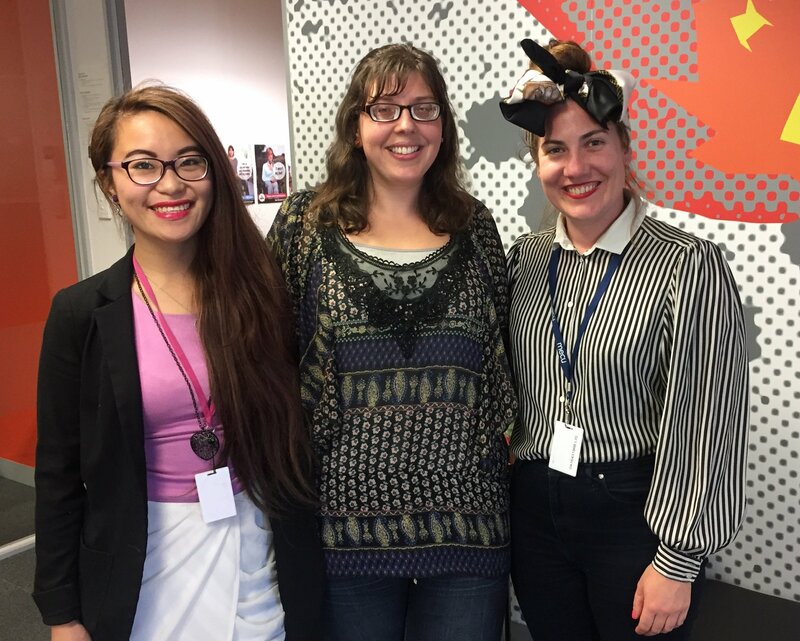 This fortnight we were thrilled to receive a visit from HESTA and ME Bank who came to celebrate WDV being awarded the HESTA Community Sector Award in the Social Impact category. The award will support WDV to develop our website. It was fantastic to receive this important support. We thank ME, HESTA and our nominators, Women's Health Victoria and VicHealth for their support and for sharing the occasion with us. PHOTO: The WDV team holding the novelty cheque with representatives from ME and HESTA. LEFT TO RIGHT: Finny George (ME), Denille Sutton from (ME), Nick Duffy (HESTA), Nadja Sahinovic (HESTA), Keran Howe, Mary-Ann Robinson, Akii Ngo, Bridget Jolley, Dee Henry, Jen Hargrave, Fofi Christou, Cath McNamara and Renee MacCoy (HESTA). People are marking international Women's Day in so many wonderful ways. Here are just some of the things you are invited to be involved in. Women's Health Goulburn North East breakfast - March 10, Wangaratta Turf Club. Author Dr Leslie Cannold will be guest speaker. Her books include 'What, No Baby?' and 'The Book of Rachael.' Book for the WHGNE Breakfast. Register to attend the WHISE awards. Nominate a woman over 55 in categories for Aboriginal Women, Cultural Leaders and Women with Disabilities. WHISE awards nominations close February 24. Join moderator Jax Jacki Brown and panelists Nayuka Gorrie, Evelyn Morris, and Yassmin Abdel-Magied as they examine outdated but long-entrenched power structures within society and question whether equality can be found working within its parameters or if destruction and revolution is the only way forward. Book free tickets. This $15/25 dance party night features feminist DJ Whiskey Houston. We Are Union Women are also hosting a range of events with disability access including a pub night and a rights at work conference. See their WRAW Fest Program. 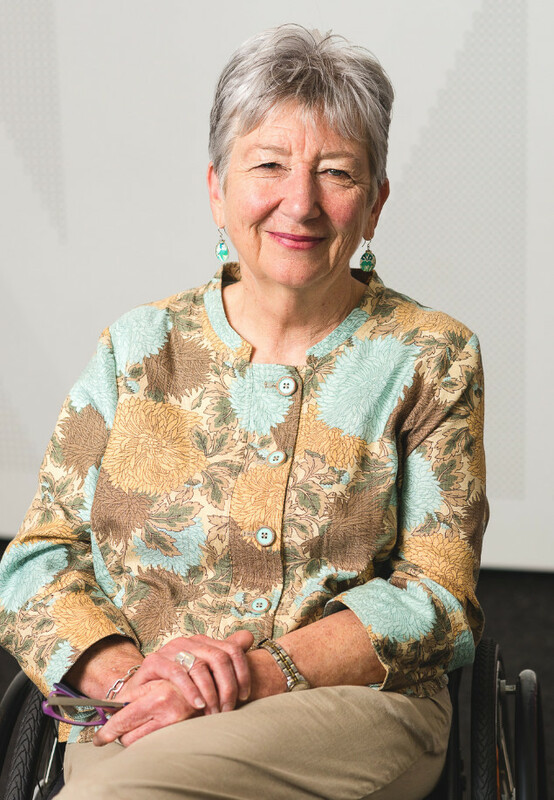 Facilitator: Dr Kay Cook, School of Global, Urban & Social Studies, RMIT University, will lead a panel of experts. RSVP with Good Shepherd. If you have questions about getting ready for your planning conversation or want to hear about how you may best implement your plan, this is the webinar for you. Tuesday 28 February 2017, 2.00pm – 3.00pm, Register for the webinar. Funding rounds for Information, Linkages and Capacity Building (ILC) National Readiness Grants for organisations opened in late January. ILC is key part of the NDIS, it is focused on making sure people with disability are connected to their communities and that communities become more accessible and inclusive of people with disability. The ILC toolkit provides information on how to get ready for ILC. Applications must be submitted by 2:00pm on 8 March 2017. An NDIS Quality and Safeguarding Framework has been announced by Federal Minister Christian Porter. - and a list of registered workers. State complaints and oversight systems will stay in place during transition, and some will stay in place afterwards too. For now, the Victorian Government will still manage complaints the same way and keep an eye on registered service providers and workers. WDV is advocating for the new system to take prevention of violence and safety seriously. People with Disability Australia and Monash University are doing a research project, Women, Disability and Violence: Creating Access to Justice, funded by Australia’s National Organisation on Women’s Safety (ANROWS). They are running small focus groups in Melbourne to ask women questions like 'what is the ‘right’ response to violence?' and 'what counts as justice?. Participation in the focus group is entirely voluntary, and all contributions will be kept anonymous and confidential. Access to counselling and individual advocacy will be facilitated through the focus groups. A $50 gift card will be given as thanks contributions. RSVP and enquries: Tuesday 28th February to jessc@pwd.org.au. Women’s Circus is thrilled to launch Groundwork, a program that provides a 2 week supported residency for a female artist with a physical disability and the delivery of a program of masterclasses, workshops and discussions to stimulate broader conversations around inclusive practice. There is a $2000 financial contribution during residency at the Footscray Drill Hall, and an available $1000 fund to support any related access costs. Women’s Circus is fully wheelchair accessible including carpark, ramp and toilets. For more information and to apply head to Women’s Circus website, 6th March. Inquires: Devon, 03 9687 3665 / execdirector@womenscircus.org.au. PHOTO of performers clasping hands. Women's Health West is seeking a woman who is highly experienced in group facilitation, has excellent practical and theoretical skills, and who works within community development and feminist frameworks to engage women with a disability and women who are carers to build skills and confidence for women to enhance their wellbeing and advocate change. Applications to Women's Health West close 22 February. WIRE is currently looking for an experienced Research Project Officer – Family Violence and Financial Wellbeing: Maximising Teachable Moments. Fixed-term contract, Part – Time .6 EFT, 15 Month Contract. Improve your computer/ internet skills. Learn how to apply for jobs online or just check email or Facebook. FREE Basic Computer Classes 4x Weekly Tuesdays 11am–1pm. Covers basic including using a mouse, setting up email and word processing, each class runs for 4 weeks on Tuesdays 11am to 1pm with a volunteer tutor. Book for classes with WIRE, CALL (03) 9348 9416 (Option 2) / email inforequests@wire.org.au. The The Australian Government is offering grants of up to $10,000 to assist people with disability to participate in nationally-focused, disability-related conferences held in Australia. The Hon Jane Prentice, Assistant Minister for Social Services and Disability Services, said the the National Disability Conference Initiative will ensure people with disability have the opportunity to participate in conferences about issues affecting their lives. Grant applications close 14 March. Join with potential and current leaders from new and emerging communities across Victoria to build your leadership skills and contribute to your community. Apply through Leadership Victoria. Naomi Fryers writes for Eureka Street, "I am an Australian mental health client who has been a consumer of both public and private inpatient service facilities. In my mid-20s, I was one of those people in the 'lucky country' who got 'unlucky' enough to be sectioned under the Mental Health Act into the public inpatient system. It was a harrowing experience." "During my own inpatient admission, rather than spending my time recovering in hospital, I became hyper-vigilant in regards to my own safety. Had I slept a wink during that ten-day admission, I would have done so with one eye open." "Not everyone can afford the private health insurance required for a private admission, but everyone should have the right to be treated with dignity and respect; the disparity between current public and private systems is little more than institutionalised discrimination. The government should be addressing the gaps and aiming to bring the public system up to par. We can do much better." Read Naomi's piece in Eureka Street. Copyright © 2017 Women with Disabilities Victoria, All rights reserved.